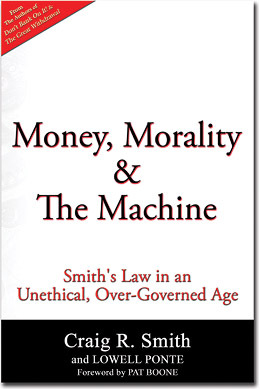 Lowell Ponte, a veteran think tank futurist and former Reader's Digest Roving Editor, is co-author, with Craig R. Smith, of the 2016 book Money, Morality & The Machine: Smith's Law in an Unethical, Over-Governed Age. which foresaw the importance of Donald Trump's achievement. As news of Donald Trump's growing state victories circled the world, Dow Futures plummeted by 960 points as globalist investors rushed to flee the stock bubble and seek the security of gold, driving the precious metal's price up by 4 percent in a matter of minutes. Those who live in the fantasy world of Politically Correct ideology also panicked in fear, crashing Canada's immigration website as they rushed to escape before this uprising of the working Americans engulfed them. Brexit refers to the British exit from the European Union (EU) that United Kingdom (U.K.) voters approved last June in a rare national referendum vote. A majority of Brits discovered that 62 percent of their laws and regulations were now imposed by unelected Eurocrats of the EU. Under EU rules, Great Britain was being flooded by foreigners who could not be refused entry; the nation's borders and sovereignty were literally being erased. “I want my country back,” wrote British novelist Frederick Forsyth, author of The Day of the Jackal and The Odessa File. He was among the 52 percent of voters who favored Brexit. American voters likewise chose Donald Trump on November 8 to take America back from globalist elitists such as former Secretary of State Hillary Clinton and President Barack Obama who have tried to transform our country with a flood of illegal immigrants, and to circumvent our Constitution through Executive Orders and a weaponized bureaucracy of partisan regulatory bullies. Ironically, the elite leftist media decided to promote what they thought would be the weakest GOP contender to help Hillary Clinton win. The mainstream media showered political newcomer Donald Trump with what the New York Times calculated was a political contribution of at least $2 Billion worth of free airtime. They also did this in part to boost their own ratings by airing this successful reality TV star. And, of course, as soon as Trump bested his Republican rivals and became the GOP nominee, the liberal media turned and viciously savaged him. The media set him up to be Mrs. Clinton's stepping stone back to the White House. The 1964 movie Becket tells the true story of a young man, a close friend of the British king, who enjoys the wealth and debauchery his immoral monarch provides. Then one day the king, annoyed by the Archbishop of Canterbury's opposition to royal taxes, appoints the young man, Thomas A Becket, to replace the Archbishop. At first Becket and the king treat his new job as a joke. Becket, however, begins to see those robbed by the king as his spiritual responsibility. In this role actor Richard Burton says: “But what if one day Becket find his honor?” He defends the church against the king. Donald Trump used to be a crony capitalist who lived a life of debauchery and government favors in exchange for lavish donations to dirty politicians such as Bill and Hillary Clinton. When the liberal media recently pointed to Trump's past sin and sexism, it usually cited what he did when still a liberal Democrat prior to becoming a Republican in 2009. Like Becket, Trump knew the immorality of the Progressive elitists who view themselves as superior and entitled to rule the rest of us. He was such a friend of our ruling elite that the Clintons attended his third wedding. But like Becket, Trump seems to have found his honor in a commitment to help free America from the Progressive economic and political globalist rulers that Craig R. Smith and I describe in our 2016 book Money, Morality & The Machine: Smith's Law in an Unethical, Over-Governed Age. Trump apparently aims to replace corrupt crony capitalism with a much more free, honest, and less taxing economic system. And he has demonstrated himself to be a man of destiny by surviving controversies that would have destroyed an ordinary politician. He triumphed over the global elites of both major political parties and the press. We explain who these globalist rulers and what their Progressive ideologies are; how they have brought America to the brink of disaster; and why they see Americanism and America as things to be mocked and destroyed. Donald Trump's election and Brexit are both part of a larger world-wide uprising against globalist plans -- from trade agreements to claims of global warming, to impose what President George H.W. Bush referred to as “the New World Order,” which is a new kind of empire with values very different from the U.S. Constitution, as we explain. We show how, by debasing our money, these elitists have debased human values in much of our society. What they plan next is a “cashless” society of dependence and vanishing freedom, as we explain. And we show how you can take steps to protect yourself and your family from the risks these elitists have set in motion – risks that may be hard to remedy, even under President Donald Trump. By taking such steps, you can help make both your family and America more secure.